A revelatory exploration of the science of persuasion, from the author of the international bestseller, Influence. Someone recently recommended that I read his new book Pre-suasion. This book is about research into “Priming”. This is the idea that our decisions are substantially influenced by seemingly trivial items. For example, a company was introducing a new soft drink and had representatives stationed in a mall. Their job was to stop shoppers, explain the features of the new soft drink and attempt to gain the shoppers email address in exchange for the promise of a sample. The success rate was less than 33%. But when a Pre-Suasion question, “Are you adventurous?” was asked prior to launching into the discussion about the new soft drink, the results were astounding. First 97% of the people responded that there were in fact adventurous. They all had a better than average sense of humour as well . But what was really amazing was that once people had affirmed they were adventurous, the success rate shot up to 75%. A key message of the book is that we like those who are like us, be it liking the same sports or sharing a nationality. This is also a key message of the Humm-Wadsworth. [...] If two individuals share a dominant Humm Component, it is highly likely they will get along with each other. A wonderful example of this “liking” effect were the Lithuanian Jews who had escaped to Shanghai and Japan during WWII after gaining Japanese travel visas. The Japanese, post Pearl Harbour, had become allies of the Nazis who in turn demanded these Jews be killed. The Japanese asked the Jews why they were so hated by the Nazis. The answer by Rabbi Kalisch was telling, “It is because we are Asians, just like you.” Understanding the social power of saying the right thing at the right time saved a large group of Jews from death. Another interesting application discussed in the book is when to use “I think” or “I feel.” Normals and Engineers are logical in their decision making and “I think” is the best approach. By contrast the other five Humm components are emotional in their decision making and “I feel” is the best approach. This is a great example of Practical Emotional Intelligence in action. I found Pre-suasion to be a lively and engaging book. It’s a tour through social psychology. Note the actual book is 233 pages long but the references and end notes are about 150 pages. Disclosure - I have only read a little over the first 100 pages. The problem is I'm afraid to finish this book. Not for lack of trying. I've read these 100 pages over and over again. They are incredible. Beyond incredible. Intellectually stimulating yet also practical. Useful. Profitable. I've already made significant changes to my business and seen the impact on my bottom line. It's also made me a better person by practicing and using these principles on myself. And to think I almost didn't read this book in the first place. Why? Years ago I read Robert Cialdini's book Influence Influence: The Psychology of Persuasion, Revised Edition and unlike all other books about persuasion out at the time, Cialdini's was backed by actual research, not anecdotal. Simply put, it was the best book on persuasion that I have ever read. I read that book 9 years ago and I still use something I learned from that book in my business every day. 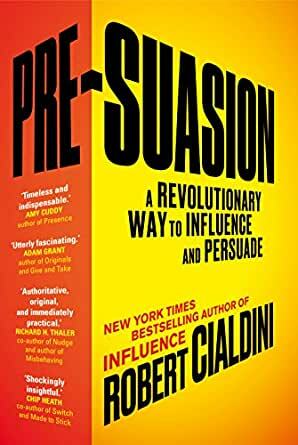 For some dumb reason I was hesitant to read Pre-suasion at first because I didn't want to taint my experience with Cialdini as an author, having written one of my all time favorite books. Then I watched a podcast that Joe Polish did with Cialdini and realize I was foolish for dragging my feet so I bought Pre-suasion. I had heard from several people already before that how good the book was, but you know how some people are - quick to dish out the hyperbole. In retrospect everyone who told me how good the book was undersold it. It's not just good. It's not even great. It, to me, is the evolution of Influence. I haven't even read the whole thing yet and I think it might already be my new favorite book on persuasion. I can only imagine the untold number of success stories that are come from this book. To think, a retired professor was able to write something so impactful to business that it surpassed all these books that actual successful businessmen and marketers put out. Hey, I'll take it. This is not an optional read if you're in business or want to be in business. If you go into any category, niche or field and you run up against a competitor who has read and practices presuasion and you don't... I can't understate how much of a disadvantage you'll be at.